Fall has arrived and lately I’ve been craving butternut squash. 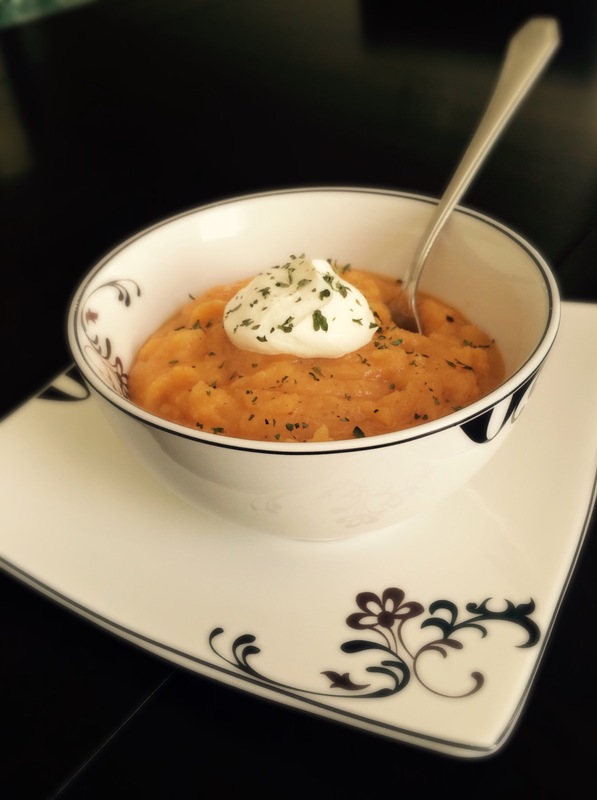 To satisfy that craving, I tried my hand at a new soup this past weekend that incorporated both a hearty butternut squash and a couple sweet potatoes. Combined, the two vegetables make a high-vitamin, fiber-dense dish that’s also very tasty! *This is when I measured the butternut squash, which explains the “cooked” weight listed above. 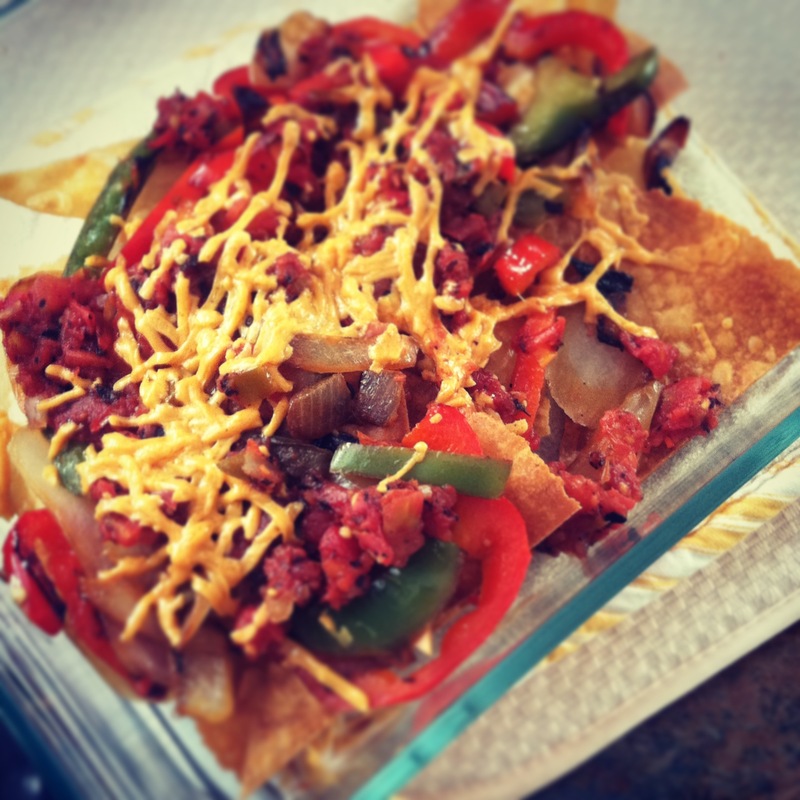 Since I’m 34 weeks pregnant and already incorporating greater amounts of phe into my diet, this recipe was purposely made with the intention of being slightly higher in phe. However, you can easily adapt this recipe for a version that is lower in phe by using a 32 oz. package of Swanson’s Certified Organic Vegetable Broth instead of the chicken broth. The adjusted nutritional values would be 170 mg. and 210 calories per 1 ½ cup serving. Here’s a super easy, one-pot dish that’s become a favorite of mine for making in bulk and taking it for lunch during the work week. Add low-protein pasta or low-protein rice for more volume. Just adjust phe accordingly. This is an adaptation of a recipe that was recently served to my entire family over the Memorial Day weekend. It originally included smoked sausage, but that was obviously omitted for my portion. 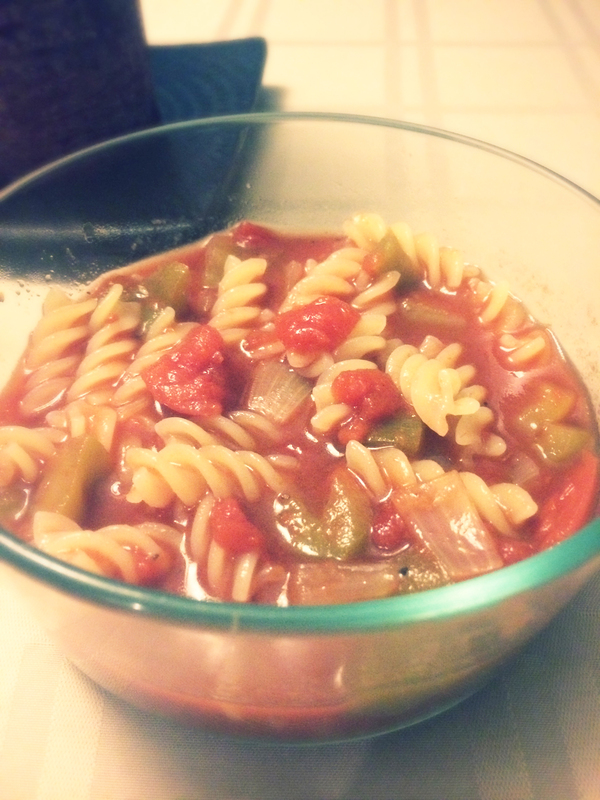 I liked its flavor so much I made it again last night (and probably will again this evening). Preheat your oven to 375ºF. 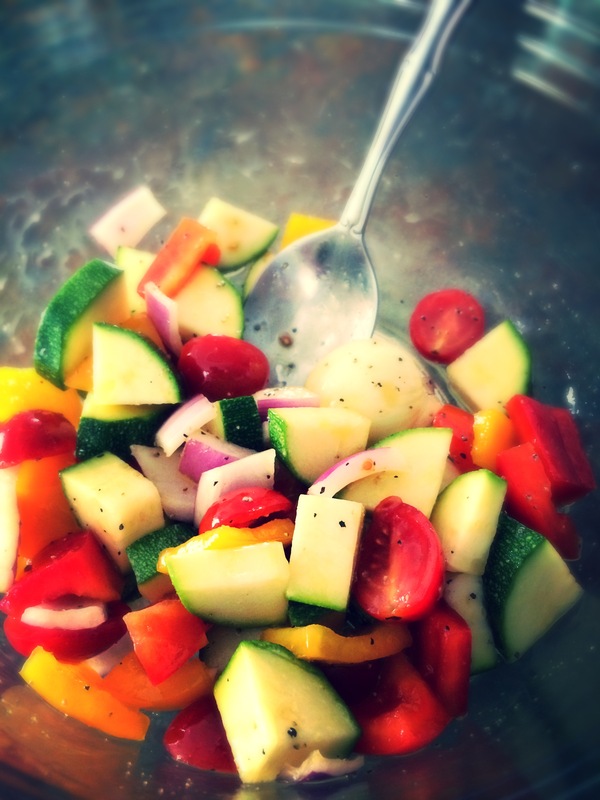 Mix all of the vegetables, garlic, olive oil, salt and pepper well in a large mixing bowl. Spread the vegetable mixture evenly on a large sheet pan. Roast the vegetables on the middle oven rack for 10 minutes. Stir vegetables and place back on the middle oven rack for another 10 minutes. Meanwhile, cook the pasta according to the package directions, reserving ½ cup of the cooking liquid. 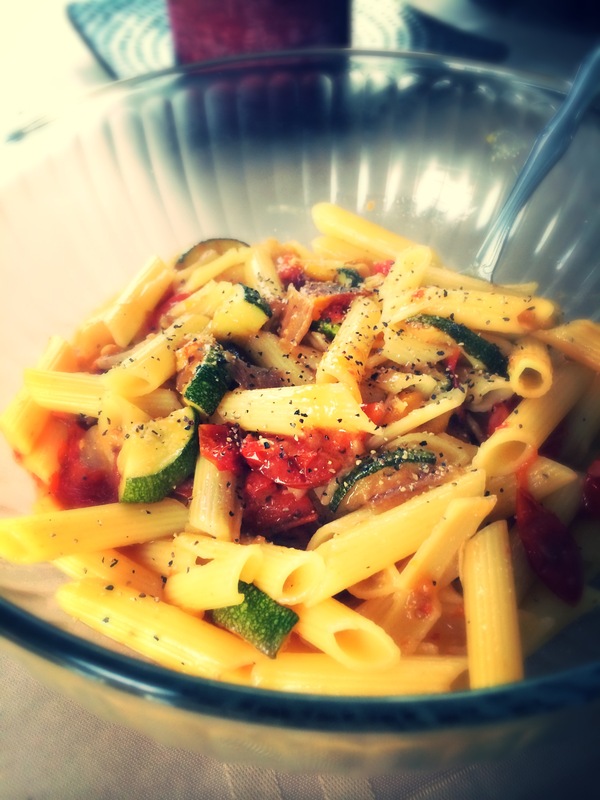 * Since the pasta will be cooked again briefly with the roasted vegetables and other ingredients added, you may want to cut off a few minutes of the recommended cooking time in order to avoid mushy noodles. Remove the vegetables and set the pan aside. Remove the roasted garlic cloves from the roasting pan, smash to a paste with a fork and add to the reserved pasta cooking liquid. Return the pasta to the pot it was cooked in over medium-high heat. Add the butter, wine, reserved cooking water and vegetables to the pasta. Stir the pasta gently and cook until the liquid is about ¾ absorbed. Serve immediately, adding more salt and pepper if needed. I’m listing this as one serving; however, if you’re making this for kids with limited appetites, you could probably stretch this a bit further. I’ve also listed separate phe and calorie counts in case you’d like to use a different kind of low-protein pasta or even experiment with imitation rice. Here’s a flavorful and easy side dish I came across on Pinterest. I adapted the recipe slightly by using baby portabella mushrooms and also did the math to figure out phenylalanine and calorie numbers. Preheat oven to 400°F. Rinse the mushrooms, if necessary, and set aside. Combine the olive oil, balsamic vinegar, garlic, thyme, cayenne, salt and pepper in a bowl and whisk until evenly blended. Toss the mushrooms in this mixture until they are evenly coated. 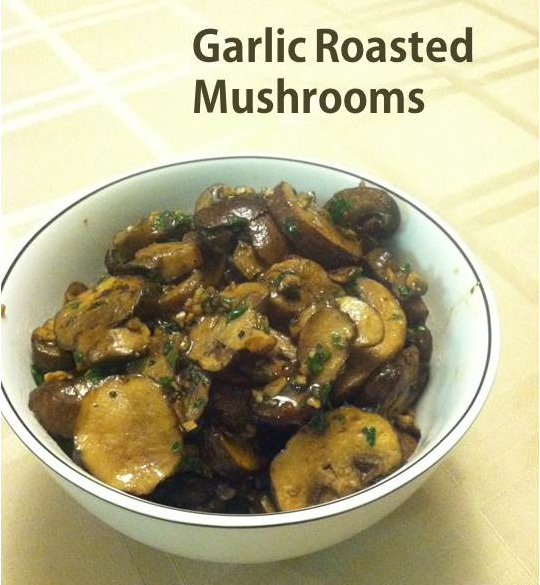 Place them into a 7×11″ baking dish and make sure the mushrooms are spread out in a single layer. Roast the mushrooms for about 25 minutes. Remove from oven, sprinkle with the parsley and serve. After making this a couple times, I’ve served it along with Cambrooke Foods Pierogi or if I still have a good amount a phe left in the day, I’ll use it as a side dish to a baked potato. First stuffing and now casserole? I must be on a comfort-foods kick! 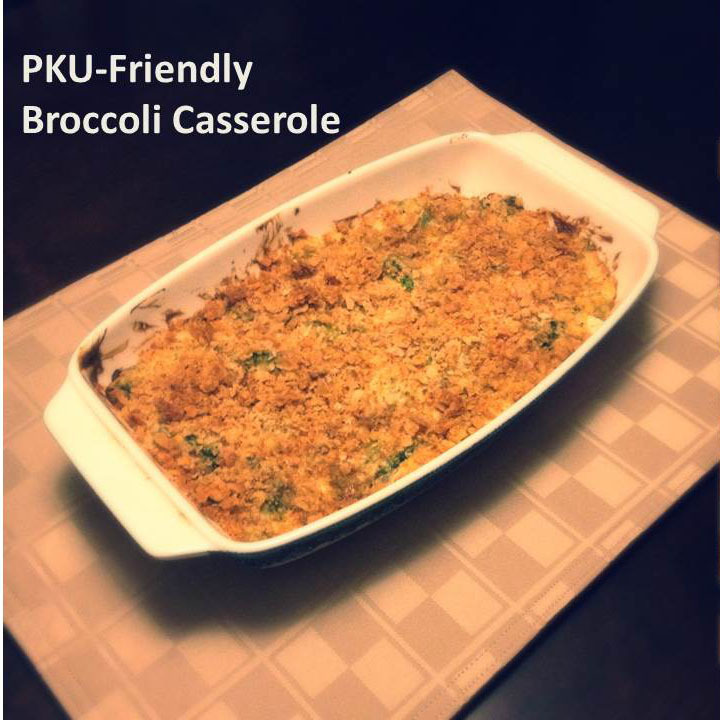 At any rate, here is an easy recipe for low-protein broccoli casserole. I estimate only 20 minutes of prep-time followed by 45 minutes of baking. Preheat oven to 350 degrees. Melt 2 tablespoons butter in a medium skillet over medium-high heat. Sauté onion until golden. In a mixing bowl, stir together onion, broccoli (no need to thaw), soup, cheese, mayonnaise, garlic salt, pepper, seasoned salt, and lemon juice. Once thoroughly blended, transfer mixture to 2-quart casserole dish. Evenly spread low-protein garlic crumbs over top and drizzle with remaining tablespoon of melted butter. Bake uncovered in preheated oven for 45 minutes, until heated through and browned on top. On the surface, the four servings may not look like there is enough to satisfy. If that’s the case, add more volume by mixing one serving with 1/3 cup of Cambrooke Foods’ Short Grain Rice. Cook the imitation rice according to the package instructions before mixing. It is well into the 10 o’clock hour the night before Thanksgiving and I have just spent all day cooking a series of low-protein recipes in anticipation of the big holiday. 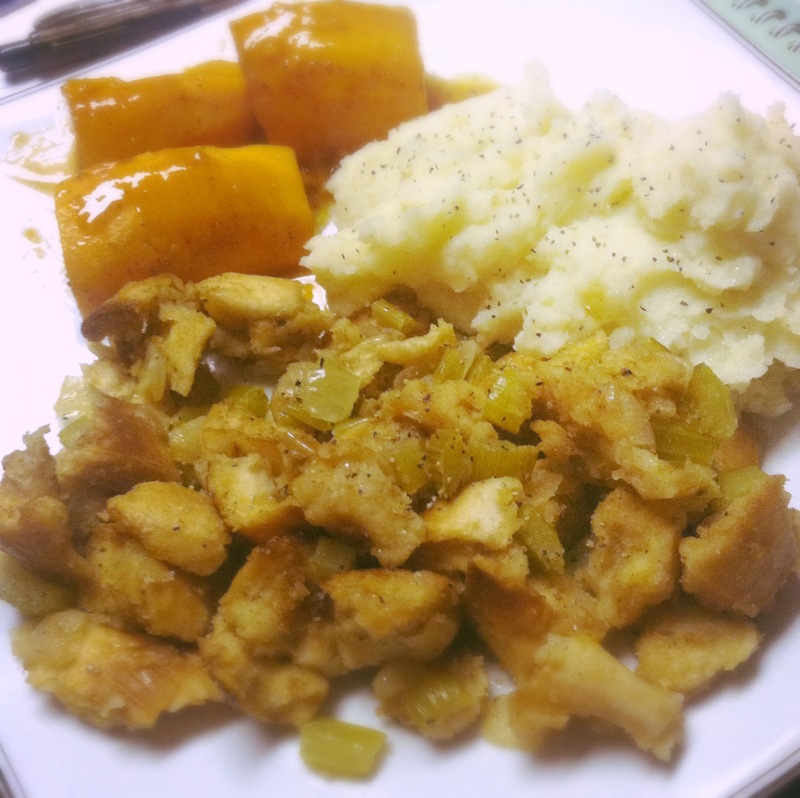 Almost all of the dishes I made were borrowed recipes; however, I did try my hand at making an original low-protein version of stuffing. After defrosting the Cambrooke Artisan Bread overnight, slice the rolls with a bread knife into one-inch thick slices. Place on a baking sheet and broil for 2 minutes. Flip slices of bread and broil for another 2 minutes. Remove toasted bread from the oven and place in a large mixing bowl to cool. Meantime, melt the butter in a medium skillet over medium-high heat. Add onion and celery, cook until onion is clear and celery is al dente. Remove from heat and allow to cool. Once sliced bread has cooled, use hands to tear and break into small bite-sized pieces. Sprinkle with poultry seasoning and toss until coated. Scrape the sautéed vegetable mixture onto seasoned bread and mix. Next, drizzle vegetable broth onto bread and vegetables until evenly coated; pausing the pour to toss the bread as needed. By the way, special thanks to my mother who helped troubleshoot this recipe in a practice round earlier this week. Love you, Mom! !